1 Happy New Year all. Showers of rain between 0500-0630, sometimes even heavy including some hail and gusty winds up to 40KT. More light to moderate rain showers passed by between 0930-1100. Total in collector: 13 mm. After some As Cs & Sc fields becoming partly cloudy with Cu, towards sunset even fair with some thick Ci in W. Top Tmax: Ghent & Koksijde 9,6°C, Zaventem had 8,7°C. Today, in the morning and afternoon, some weak thunderstorms over the provinces of West-Vlaanderen, Hainaut, Brabant, Limbourg and the southern edge of Oost-Vlaanderen & eastern edge of Antwerp. Today's top gust observed in showers during noon and early afternoon: Spa: 52KT, Charleroi & Florennes had 46KT. 2 Some light rain showers during the early night, afterwards dry till noon, followed by more rain showers till 2100: total was 7 mm. Top Tmax: Ostend 9,2°C, Zaventem had 6,9°C. 3 Cloudy to very cloudy with Sc, Ac & Cs. Tempo slight rain between 1100-1500. Top Tmax: Koksijde 9,2°C, Zaventem 7,9°C. 4 Light rain between 0700-0800 =1 mm. Afterwards cloudy to very Sc Cu cloudy. Top Tmax: Koksijde 10,9°C, Zaventem 9,8°C. 5 Cloudy to very cloudy with Sc, from 1530 (s)light rain & drizzle giving 1 mm. Top Tmax: Ostend 11,3°C, Zaventem had 9,9°C. 6 Sc overcast, from 1130 on (light) rain & drizzle giving 14 mm by midnight. Top Tmax: Chièvres 11,8°C, Zaventem had 11,3°C. 7 Rain eased off around 0430 giving 1 mm. Afterwards partly cloudy to cloudy with Cu, Ac, Ci later during afternoon Cs. Slight rain between 1100-1300 and from 2300 on Top Tmax: Kleine Brogel 10,3°C, Zaventem had 10,0°C. 8 Rainy between 0230-1030 giving 4 mm. Afterwards cloudy with Cu, Sc, Ac, Ci. Renewal of (s)light rain between 1700-2300 giving 1 mm. Top Tmax: Ukkel 11,0°C, Zaventem had 10,5°C. 9 Some (s)light intermittent rain & drizzle between 0100-1000. Afterwards cloudy to very cloudy with Sc. Very mild but quite windy, with even a severe gust of 41KT around 1300. 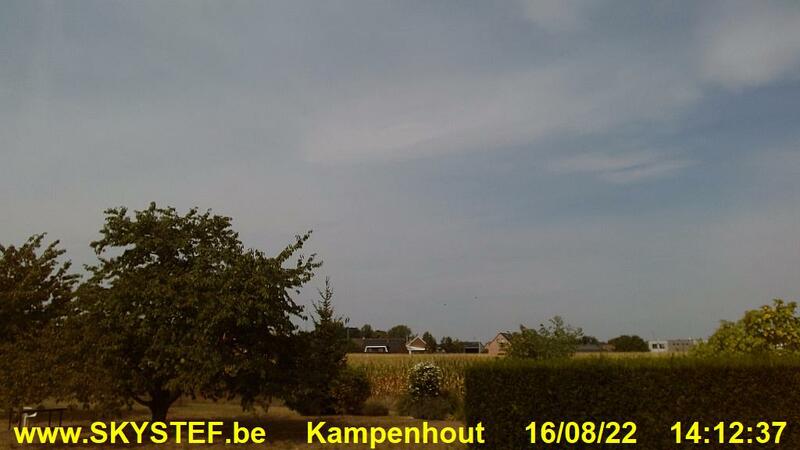 Top Tmax: Kleine Brogel & Diest 14,7°C, Zaventem had 13,5°C. Other stations >14°C were: Semmerzake 14,5°C, Deurne 14,3°C, Ghent 14,2°C, Ostend 14,0°C. 10 Cloudy to very cloudy with Ac As, showery rainy between 1300-1700 = 8 mm, around 1650 even a near rumble of thunder accompanied by a gust of 47KT. Afterwards breaking cloudiness. Top Tmax: Kleine Brogel 14,0°C, Zaventem had 13,4°C. Top gust: Spa 49KT. Today, around sunset, a few rumbles over province of Vlaams-Brabant. 11 Soon becoming very cloudy to overcast with Cs As. Light rain between 0830-1130. Early afternoon very windy with gusts up 50KT, light to moderate rain & drizzle between 1500-1800. Total = 4 mm. Afterwards turning dry with breaking clouds. Top Tmax: Ghent 12,2°C, Zaventem had 11,4°C. Top gust: Liège 53KT, Ostend, Beauvechain, Zaventem, Spa 52KT, Charleroi 51KT. Today, around 1700, again a few rumbles of thunder over the east of province Oost-Vlaanderen. 12 Cloudy to very cloudy with St Sc. Drizzle between 1630-2230. Top Tmax: Ghent & Koksijde 12,2°C, Zaventem had 11,3°C. Top gust Ostend 45KT. 13 Light rain drizzle between 0600-1030, afterwards very cloudy with S, renewal intermittent light drizzle from 1630 on. Top Tmax: Ghent 11,5°C, Zaventem had 11,0°C. Top gust Ostend 41KT. 14 Rain drizzle eased of around 0200. Afterwards clearing skies with only a few Cu Sc and scattered Ci. Top Tmax: Kleine Brogel 10,4°C, Zaventem had 8,8°C. 15 Starting sunny with few Ci, late afternoon tempo some Sc fields. Top Tmax: Kleine Brogel 9,5°C, Zaventem had 8,0°C. 16 Light rain between 0600-1100 = 2 mm, afterwards very cloudy with Ac As. Top Tmax: Koksijde 9,9°C, Zaventem 9,5°C. 17 Very cloudy to overcast with light rain between 1300-1700 = 5 mm. Top Tmax: Kleine Brogel 12,3°C, Zaventem had 12,0°C. Top gust. Deurne: 47KT, Ukkel 45KT, Zaventem, Chièvres, Beauvechain & Spa 41KT. 18 Very cloudy to overcast with rain & drizzle between 0100-1800 = 14 mm, afterwards breaking cloudiness. Between 0900-2100 gusty winds exceeding 40KT, with around 1750 even a peak of around 60KT with mean speed of around 46KT. Top Tmax: Diest 15,1°C, Zaventem had 14,7°C. Today, a storm crossed Belgium, with a mean speed in most places of gale force, some locations strong gale force and along the coast storm force. Top gusts: Spa 70KT, Mont Rigi 68KT, Charlerloi 66KT, Koksijde 65KT, Deurne 63KT, Ghent & Ostend 62KT, Liège 61KT, Diest, Beauvechain & Retie 60KT, Zaventem & Humain 59KT, remainder of the stations between 52-56KT. Besides the structural damage also five people lost (indirect) life. Some metars: translation is possible by copy paste one line into a decoder. Check also the windspeed converter. 19 A couple of rain showers during the night, the last one around 0930, they gave 13 mm. Afterwards partly cloudy with scattered CI an a few Cu. Towards sunset increasing high & medium level cloudiness and after 2100 also low clouds. Top Tmax: Chièvres 13,7°C, Zaventem had 12,9°C. 20 Very cloudy with Sc, light rain between 1030-1400. Clearing skies towards sunset. Top Tmax:Kleine Brogel 13,7°C, Zaventem 13,0°C. Top gust: Zaventem 43KT, Koksijde & Ostend 41KT. 21 Some light rain & soft hail showers around 0400, 0800, even a moderate shower around 1430. After sunset few lightning was observed over the N. Top Tmax: Ostend 9,7°C, Zaventem had 8,7°C. Top gust in morning: Ostend 54KT, Liège 48KT, Deurne 45KT, Zaventem 44KT, Ghent & Charleroi 43KT, Spa 41KT. Late afternoon & early evening some weak thunderstorms over provinces of West & Oost-Vlaanderen, Antwerp, and Limbourg. 22 Cloudy to very cloudy with Sc Ac, towards sunset clearing skies from N. Top Tmax: Deurne 6,9°C, Zaventem had 5,3°C. 23 Tmin garden -3,1°C. Cloudy with lots of Ci & Cs. Top Tmax: Ostend 5,1°C, Zaventem had 0,2°C. 24 Tmin -5,2°C. Quite sunny with bit Ci, afternoon tempo some Cu Sc, after 1900 invading St. Top Tmax: Ghent 3,9°C, Zaventem 2,0°C. Some stations in the Flanders remained subzero like Kleine Brogel -1,5°C, Diest -0,9°C. During night, morning & forenoon some snow showers over the extreme west: official recordings said Ostend had 4 cm, Koksijde 2cm, but locally amounts up to 8 cm have been reported. 25 Tmin -3,0°C. Cloudy to very cloudy with St later Sc, clearing skies after 1900. Top Tmax: Koksijde 1,8°C, Zaventem had 0,0°C. 26 Tmin was reached before midnight : -5,8°C. Becoming cloudy to very cloudy with Ac, later Sc. Tempo some light snow flurries between 1300-1530, afterwards turning into rain & drizzle. Dry after 2030 but misty. Top Tmax: Ostend 6,6°C, Zaventem had 2,2°C. Over the hills (Elsenborn, Spa, St-Hubert) 1 to 2 cm of snow was measured by midnight. 27 After midnight breaking cloudiness, but also tempo a few light rain showers between 0300-0430, and around 1300. After 1500 becoming very cloudy with light rain between 1630-2130: 4 mm. Top Tmax: Koksijde 8,5°C, Zaventem had 6,9°C. Over the hills (Elsenborn, Spa, St-Hubert) still a small (melting) snow cover of 1 to 2 cm. 28 Very cloudy to overcast with Sc. Light rain & drizzle 1500-2300 = 1 mm. Top Tmax: Koksijde 8,3°C, Zaventem had 5,9°C. 29 Very cloudy to overcast with St, Sc, sometimes a bit light rain & drizzle. Top Tmax: Ostend 9,7°C, Zaventem had 9,1°C. 30 Very cloudy to overcast with Sc, during night and morning also St. Top Tmax: Ghent 10,1°C, Zaventem had 8,9°C. 31 Very cloudy to overcast with St, Sc, from 2030 (s)light drizzle. Top Tmax: Kleine Brogel 10,1°C, Zaventem had 8,0°C.